I really enjoyed this interesting and easy wrap. I loved the texture of the dry fried tofu as a meat substitute. The chipotle and coffee marinade is very interesting, with a punch of spice and smokiness that balanced well with the sweetness of the tomatoes and the corn. Since the tofu is largely make-ahead (for instance, the night before or earlier in the afternoon before taking your vizsla¹ to the vet because he has been inexplicably limping for days), this dish is really easy and comes together very quickly. You can customize the filling based on how industrious you are feeling and what you have on hand – had I been less lazy, I would have made a quick salsa out of the corn with onion and cilantro, or perhaps made some guacamole. But this worked quite well in it’s simplicity, and I know all of us need some super-easy weeknight meals from time to time. I packed the components separately in my bento box for lunch the next day, and it traveled well and tasted great cold. Cut tofu unto 1/2″ wide strips. Heat a cast iron or stainless steel pan over medium-low heat. Add tofu and cook about 10-15 minutes per side until moisture is leeched out and tofu is lightly golden brown. Meanwhile, add remaining ingredients to a food processor and pulse until smooth. Transfer to a medium bowl. When tofu is done cooking, let cool until cool enough to handle and cut into cubes (about six per piece of tofu). Add tofu and let marinate at least 2 hours. Add tofu and a couple tablespoons of marinade to a large sauté pan or wok over medium-high heat. Cook until heated through and marinade as formed a light glaze. Add to wrap (see below). Toss tomatoes with olive oil and season with salt and pepper. Roast 20 minutes until lightly caramelized. Pour tomato-infused oil over spinach and toss to slightly wilt. Place tortilla on a plate. Place in the microwave and microwave for 20 seconds to soften the tortilla and make for easier wrapping. 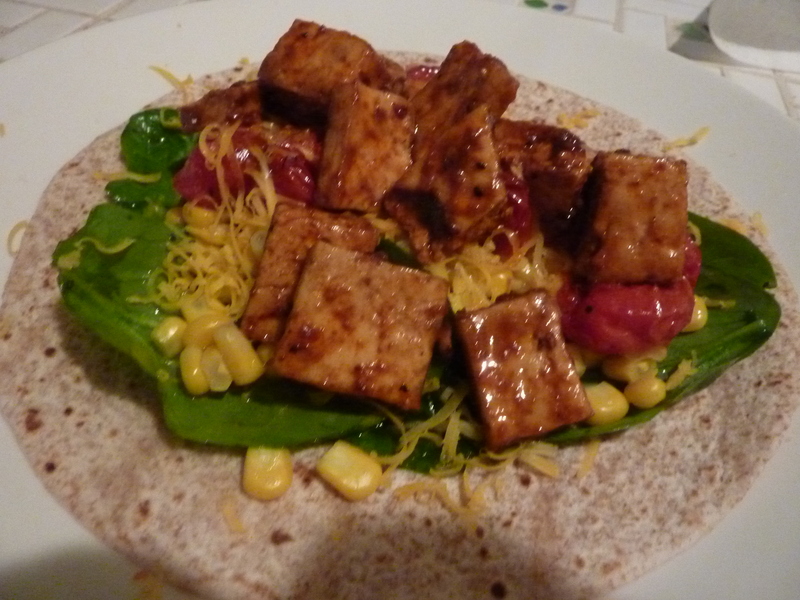 Add spinach, corn, roasted tomatoes, and tofu. Make your wrap, either by rolling it into a tube with toppings to one side, a tube one end totally closed, or by folding over two ends about 2,” folding half of the tortilla over the toppings, and rolling closed (think Chipotle).